Last month I learnt a big lesson when it came to improving my fitness levels, the importance of rest and this month I think I have learnt another big one. 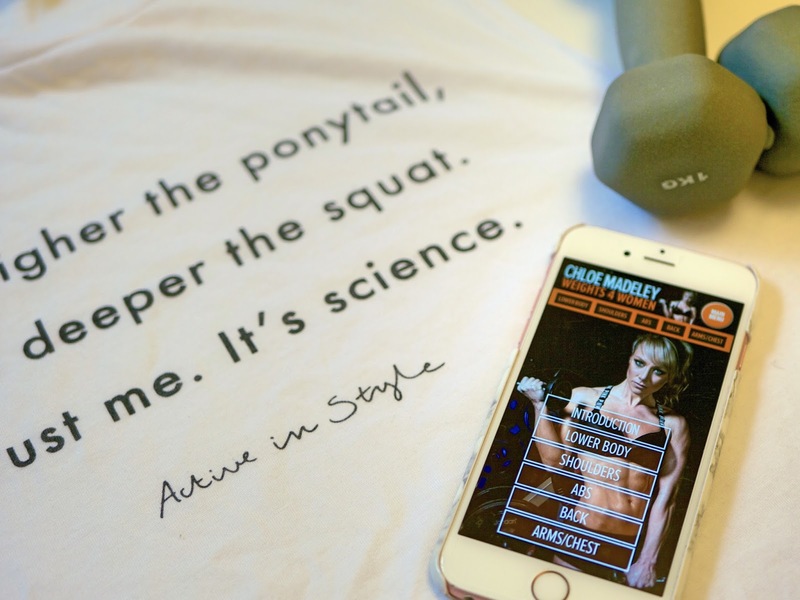 My Month | This month I decided to take on another 3 Week #ChloeApp Challenge and up my fitness game again and as part of this I took a long hard look at my diet. I can remember when I first started ‘dieting’ (God I hate that word now) and I stupidly followed the crowd like a sheep. I almost halved my calorie intake, I didn’t care what I ate as long as I stayed under my daily goal and rarely sat down to eat a decent meal. Safe to say I don’t think I ever lost any real weight and if I did as soon as I started to eat normally again I would pile it back on as my body struggled to handle the increase. These days I have started to pay much more attention to what I eat, how much I eat and when I eat and I have learnt that my body needs more than 1250 calories a day and I was stupid to ever think I could survive on that. So this month I upped not only my game but also my daily calorie intake, not massively but enough to allow my body to have a little more of what it needs and the strangest thing has happened, I’ve lost weight. As I said, lesson learnt. My Workout of the Month | This month I decided to try something new out, circuits. Previously I shied away from Circuits classes because the scared me a little bit. I saw them as being full of super fitties who could squat like it’s hot for hours on end without breaking a sweat. Wrong. It’s full of people who want to get stronger, fitter and have fun and I’m down with that! My Track of the Month | My favourite track this month (by far I have to add) is the latest Justin Timberlake offering, Can’t Stop the Feeling. It’s like Summer has been captured and condensed into four and half minutes of superb pop. Plus it’s a great running track. My Kit of the Month | I absolutely love this vest from Active in Style! Not only does it have one of the best slogans on it that I have ever seen, it fits great and is so comfortable to wear in the gym and lounge around in after. I’m sure this will be the first of many AiS purchases. Goals & Achievements | Last month I ended the month feeling accomplished and motivated after surpassing my (albeit low) expectations for the month and I wanted get to 130lbs. Never did I expect to hit 129.6lbs this month, even with the amount of effort that I have been putting in. I am so immensely proud of myself and more determined than ever to keep up the hard work. One thing I haven’t paid as much attention to this month is my Body Fat Percentage and this is because I have a new toy, callipers. Callipers are the only accurate way that you can measure this and there are a few different methods you can use to do this. But until I get to grips with them and feel happy that I am measuring myself correctly I’m not stressing over this. My next goal is to not only drop another few pounds (126 to be precise) but also to drop a few inches, particularly from my hips. This doesn’t need to be in the next month but over the next few this is where I’m looking to get to. How have you got on this month? Have you taken on any challenges or learnt any lessons?